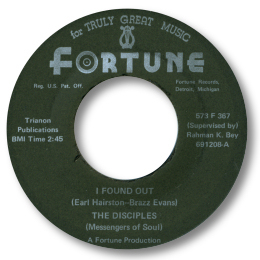 This group only had this one 45 on Jack & Devora Brown's famous Fortune label from Detroit, but may well have had other releases in the religious sector as I Found Out is amongst the nearest to secular gospel music I’ve ever heard. Fabulous interplay between the lead voices, impassioned wailing, tight background harmonies, and keyboard players straight from the church make this a deep soul piece to savour. Only the horns and the blue guitarist would sound out of place at a Baptist service. They were billed as the Messengers of Soul – and they certainly delivered big time on this cut. I wonder which gospel quartet this is.